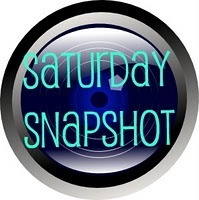 It has been Quite Some Time since I’ve participated in Saturday Snapshot. Lots of things have been going on in my life. The most time-consuming one and the reason I haven’t been seen or heard from is explained in this post. Surgery and recuperation with ongoing physical therapy have kept me busy. But I’m back and I can’t believe that this is my third post for the week, so I guess I’m getting back on track with this whole blogging thing. That being said, I’m linking up today for Saturday Snapshot with all the fun and talented people who meet up at West Metro Mommy Reads. During my recuperation, I was lucky to have the opportunity to stay at my best friend’s house which is all on one floor. It was easier to get around and it has a step-in shower. It has been a wonderful gift to be able to recover here. That comfort and convenience has been invaluable in my recovery. When I started to be up and around again, I took a walk outside to the front yard. This is what I found. 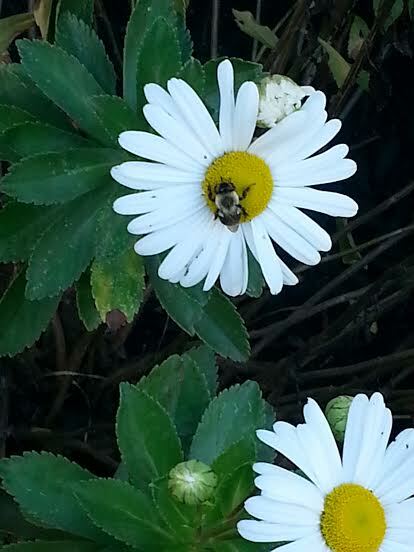 I was so happy to see the bee hard at work on the daisy. When I was growing up, daisies were always my favorite flower. My only attempt at art is drawing a single daisy, so they hold a special place in my heart. I’m looking forward to seeing all of the great photos. My first time back and I realize how much I’ve missed being part of Saturday Snapshot. Be sure to make your way over to West Metro Mommy Reads to see what everyone is sharing. Here it is the Saturday before Easter already! This year has moved along quickly. I’m here, joining in with Saturday Snapshot and I have a beautiful one (or two) from my trip to Florida at the end of March. Be sure to check out all of the other photos that everyone is sharing at West Metro Mommy Reads, hostessed by the lovely Melinda. 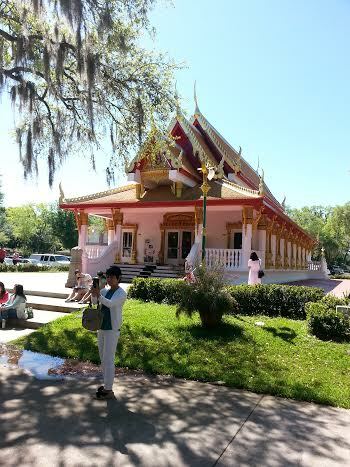 While I was in Florida, we took a trip to the Thai Buddhist Temple in Tampa. 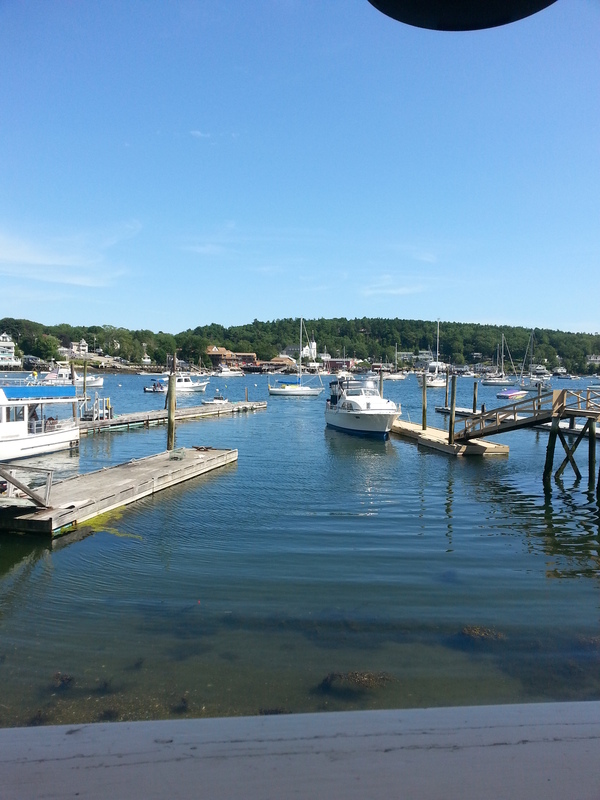 It’s a beautiful place and very popular for the food market that occurs there on Sundays. It was hard to get a shot of it without people around. Also the sun was so bright, I was never really sure how the photos would come out. 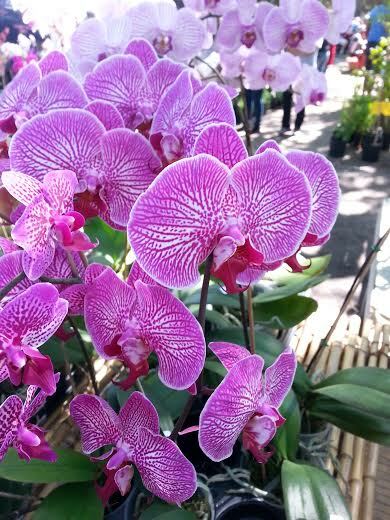 As part of the market, they were selling orchids. There were so many beautiful colors. I took quite a few photos, but again, I wasn’t sure what I had gotten until we were back in the car. This is one of my favorites. The colors were just amazing. If you ever have the opportunity to visit the Tampa/Clearwater area, be sure to make a Sunday visit to the Temple. Don’t forget to check out all of the photos over at West Metro Mommy Reads. Have a great day and Happy Easter! It’s time for Saturday Snapshot, the great link-up hostessed by the lovely Melinda at West Metro Mommy Reads. I love Saturday Snapshot because I get to see great snapshots of all of our friends’ lives all over the world. Pretty exciting if you ask me. I’ve been moaning and groaning about snow and cold for…well…all Winter! Just a bit more groaning and I think we’ll be over it. At least, I think I’ll be over it. Ralph and I were heading out to a St. Patrick’s Day lunch with his family on Monday and what happened?!? It Snowed!! I was not happy. We weren’t traveling far but some of the other family members had longer drives and I was concerned for them. This was what I saw as we was sitting in the parking lot waiting for the others to arrive. It actually was pretty, but I am so tired of it. But they tell us that on Wednesday, Spring arrived. Most of the snow was gone and I took this photo. 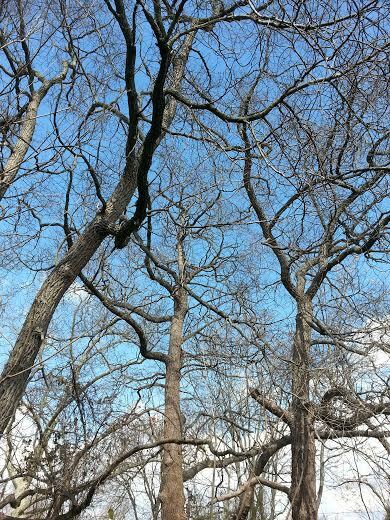 No leaves yet, but when I look, I can see the buds starting. 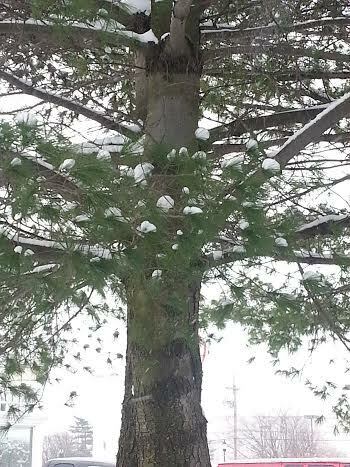 In fact, just below that center tree is where the crocus usually show their pretty heads each year. I checked this morning and not quite yet, but I bet I know what my photo will be next Saturday! Be sure to stop by at West Metro Mommy Reads to see what everyone else is sharing! This is our second Saturday Snapshot for March and I suppose I’m still complaining about Snow! I know the folks who participate in Saturday Snapshot hostessed by Melinda at West Metro Mommy Reads come from all over the place and some of them are not dealing with snow right now. Well, in New Jersey, we still are. I’m hoping that this past Monday’s snow storm will be our last for the year. Fingers crossed anyway. The day after the snow storm, I had dug myself out and needed to run some errands. I had gotten a feel for this scene from my kitchen window but because of the screen on the window, I couldn’t get a good photo. Outside, I had better luck. 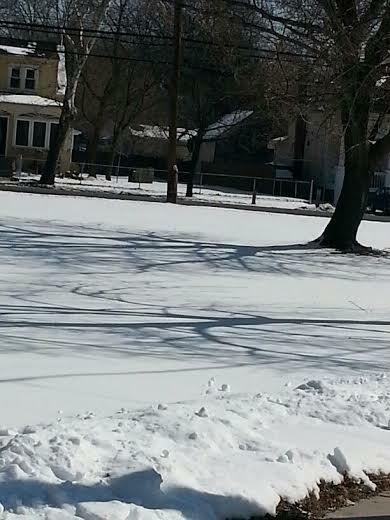 I just loved the way the shadows of the trees were captured on the snow. It made me feel a little less resentful for the snow storm. I think this photo was worth it! Be sure to check out all of the fun photos you’ll find at West Metro Mommy Reads. Another Saturday…Another Snapshot! I love the friendly group of people who are part of the Saturday Snapshot link up. Always so supportive and friendly. Sponsored of course by Melinda at West Metro Mommy Reads, Saturday Snapshot is Great Fun! Sadly, we’re back to the discussion of snow again. However. we were in the 50’s yesterday and expected to go there again for the next few days. I am actually catching glimpses of sidewalk and some brown stuff in my back yard which I can only guess is the Earth!! I’m getting pretty excited. I wanted to share a photo of a sunrise I took a few days ago. I specifically took the photo with the idea of blocking out the snow. I Was So tired of it. Some still worked its way in but for the most part it’s just sunrise. I’m so happy that the snow is on its way out! At least, I hope so. Maybe I’m being a little to optimistic. It’s got to be going away because if not I’m going to go out to have myself fitted for a stylish straight jacket!! Be sure to check out all of the great photos over at West Metro Mommy Reads. I didn’t post on Friday so I’m wishing everyone a belated Happy Valentine’s Day. Hope you got to spend it with someone you love. I did! Saturday Snapshot is one of my favorite link ups. Hostessed by the lovely Melinda at West Metro Mommy Reads, it is always great fun. Please be sure to visit there when you’re finished here to see what everyone is showing today. As you may have heard on the news…IT’S BEEN SNOWING IN NEW JERSEY!! Can you tell from my capital letters that I am shouting about this. I’m only shouting because I am SO TIRED of it. There…it’s out of my system, no more capitals. But seriously, I’m tired of it, it’s making me cranky, we got more last night and we’re supposed to get more today. Someone has to make it stop. I know how to stop it, or at least get away from it. I’m going (if only in my fertile mind…) to New Mexico. It’s sunny and beautiful and it’s going to be 72 degrees there today. None of this is fair. But I’m lucky because I know how beautiful it is and I know what’s waiting for me when I get there physically. I can’t remember if I’ve used this photo before, but I don’t care…I need to see it today and I need to share it. 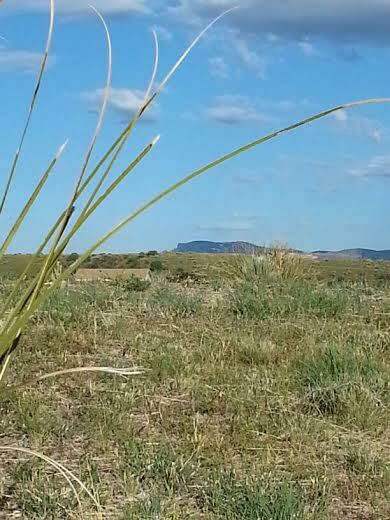 This is a view of the Kneeling Nun mountain and was taken from the front step of our house. 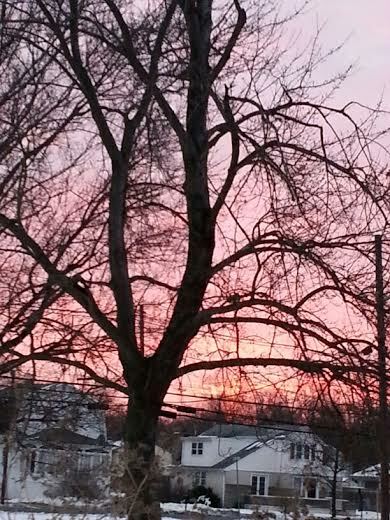 The photo doesn’t actually do justice to the beauty of the sky or the landscape, but it helps to cheer me up. I keep this photo as my lock screen on my phone so I can look at it periodically when I need it. I hope it makes you all feel as warm and happy as it makes me. Be sure to check out all of the great photography at West Metro Mommy Reads.